Recently in Calliaqua, administrative officer at the NTRC Andra Keizer held the second in a series of island-wide raffles, in which the NTRC is raffling off five GMDSS radios in 10 different fishing districts. 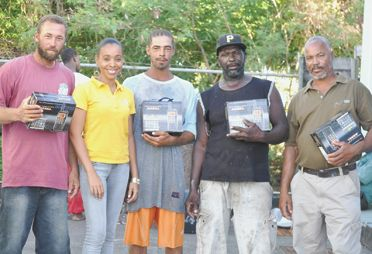 Winning the radios in Calliaqua were Hamlet George, Noel Smart, Stanley Bradshaw, Kenroy Thomas and Kimron Thomas. Keizer said that the NTRC will continue going island wide in the different fishing districts until the 50 radios are raffled off. The first of these raffles was held on Monday, April 15, at the Kingstown Fish Market at Little Tokyo. Winning at that time were Leslie Clarke, Eli Slater, Cornelius Roberts, George Browne and Andrew Gould. Keizer said that the districts will be notified when the NTRC team will visit their area. Meanwhile, registered fishermen desirous of obtaining the radios can purchase them at a subsidized price of EC$400 at the Lulleyâs Fishing Supplies chain of stores, located in Rose Place, Bequia and Union Island. Persons can also purchase them at the NTRC offices located in the National Insurance Services Building on Upper Bay Street. The GMDSS radios allows a vessel in distress at sea to send out an SOS signal just by pressing a button. The button press will send a message to the Coastguard which will tell rescuers exactly where a boat in distress is located and who exactly the boat belongs to. The GMDSS service was officially launched on Tuesday, October 2nd, 2011 at the Royal St Vincent and the Grenadines Coastguard base in Calliaqua. The GMDSS works on channel 70, while the NTRC has installed the Legacy Channel 16. A third channel that can be switched to any of the maritime VHF channels is also available on the radio, while an additional channel allows for calls to be made to land lines or mobile phones.